Peter passed away on the 26th of July 2017. Below is a bio supplied by Peter. “Joined the N.Z. Radio D.X. League in 1951 and I have gained many friends in N.Z. and worldwide through this hobby. Main interest in the early days was listening to & reporting on the low powered North American stations on the Medium Wave Band. Enjoyed Short Wave & listening to Swiss Radio International, Radio Netherlands, B.B.C, Radio Japan,H.C.J.B. Radio Canada International and Radio Australia as well as logging & sending reports to the many Pirate Stations that came on the airwaves from the early 1970’s. Pirate Q.S.L’s or verifications have been amassed from approx. 50 stations. There are still many challenges for D.X.ers on all the radio bands. The internet could be used to advantage and may even be the catalyst for a new interest in radio. I was privileged to know Peter as a good friend for over 45 years. We first met at the 1964 League convention in Christchurch and reconnected in the 1970s when I would travel south each year to attend Annual General Meetings of the League. For most of the next 2 decades, North Otago Branch in Oamaru hosted the yearly get-together, and Peter and Jill opened their home to me and other out-of-town members. Staying at the Grenfells every year, I got to know Jack, Ted and Tamsyn as they grew up – it was like being part of their family. Later, Sandra and our 2 boys would make the annual trip to Oamaru as well, and experience the Grenfell hospitality. Peter was meticulous in everything he did – including his DXing recordkeeping, stamp collecting and historical research. He was key to establishing a permanent repository for the NZ Radio DX League Archives. When I last visited Peter in March 2016 he was excited to be finalising the placement of his own personal archives in an Oamaru repository. He was also a passionate book collector and had a wonderful library – both fiction and non-fiction – and encouraged my own love of books. He would watch out for Biggles books for my collection and I, in turn, searched in vain for a Zane Grey title that Peter didn’t already have. The North Otago Branch of the DX League ran for some 50 years, to a large extent this was thanks to Peter’s efforts. He mentored many younger DX enthusiasts, including myself, over his more than 60 years of League membership. He was honoured with Life Membership of the League in 1992. 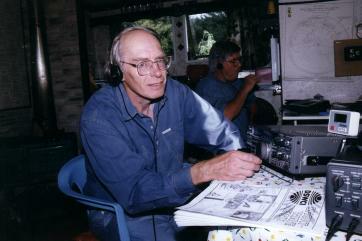 In the 1960s Peter founded a NZ branch of the Radio Japan Club, which I and other shortwave listeners subsequently joined. I remember him telling me about the opposition to the club that he faced from war veterans and families who had suffered under our wartime foes. I will always remember Peter as a true gentleman, with emphasis on the gentle. A man of strong moral character, positive outlook and uncomplaining, someone we could always turn to for wise counsel if there was a dispute or disagreement in the club. And we mustn’t forget dear Jill who was always supportive of all that Peter tackled. Peter has run a good race – he has left a positive legacy in his family, community, region and also in our club. I am honoured to have known him. It was Peter who put me in touch with the Dunedin branch of the NZRDXL when I joined 10ish years ago – we had corresponded briefly on family tree matters (my mother was a Grenfell but we decided we weren’t, to the best of our knowledge, related). Jonathan. I first met Peter in 1974 at a meeting of the North Otago Branch, high above the town in the Reservoir Rd shack. Apart from DXing, Peter was a very accomplished sportsman. Cricket was his favourite and he made the Waitaki Boys High School First XI, later representing West Coast, South Canterbury and North Otago at senior inter-provincial level. He played against some of the big names of the day including several test players. He told me one day that John Reid Snr. was a terrible sledger! Peter used to play rugby for the school in the morning and soccer in the local club competition in the afternoon. His sporting interests extended to judo and tramping. He was also a very keen philatelist and historian, writing several historic articles in recent years. Peter’s busy church life saw him involved in the committee that ran Camp Iona, the site of 3 League conventions, over many years. Add to that his involvement in many local organizations like YHA, Waitaki Boys High School and honorary treasurer for a myriad of local committees. Peter also volunteered for the local historic precinct for the annual Victorian Fete. Peter’s early employment was with the Customs Department and later as an accountant with Perpetual Trustees, rising to become the Oamaru branch manager. He underwent CMT in the navy and was very proud of his time in the naval reserve and as a member of the Royal Naval Association. He was affectionately know as the “First Sea Lord” during informal radio gatherings. Peter married Jill in 1967 and they have 3 children, Jac, Ted and Tamsyn – all now adults with their own families. Peter had a penchant for hearing Americans on MW, particularly the “250-watters”, though his best DX was a 100W station in Minnesota heard on an auroral evening from home. Fellow local DXer Don Reed had a poultry farm at Hilderthorpe in the 1950s & 60s, Peter and some of the other locals would often ride out on their bikes for an evenings DX. He had a great set-up in Sussex St, Weston for many years with a variety of aerials and pride-of-place, an Eddystone 680X receiver. One of the great catches from Weston was CFWB Campbell River 250W 1490kHz, Peter listened every night to the frequency waiting for the moment and was justly rewarded. In later years he enjoyed the thrill of chasing low-powered shortwave pirates and was a regular attendee on outings to Waianakarua. He was also a stalwart of the North Otago branch from 1951 until it went into recess over 50 years later. He would have held every committee post several times. When it came time to arrange a club meeting, BBQ, auction or a national convention, Peter was always there to assist. He also enjoyed traveling to DX conventions and AGMs in NZ and even attended a meeting of the Japan Shortwave Club in Tokyo, where he a life-long friend, Toshi Ohtake. Toshi came to our 1988 Convention at Camp Iona. Without Peter’s hard work, the League would not have an archives. He was instrumental in setting it up in Timaru in the early 70s and in the 90s when we lost use of the RNZ premises in Timaru where they were stored, it was Peter’s vision and hard work that saw them safely moved to the Hocken Library in Dunedin. Peter and his wife Jill shared a love of books and had an extensive library, with a number of first editions amongst the many books. They were members of the Zane Grey Society and traveled overseas to gatherings, with memorable trips to the UK, Grand Canyon and Pennsylvania. Peter’s health suffered in recent years, but there was always a radio close at hand. I have many fond memories of Peter, we had some great times together and he taught me an awful lot about MW DX! A life lived fully and very well. Rest in peace my old friend. A real gentleman and a true friend to all DXers. Peter DXed through a golden age, heard things we cannot imagine today and yet remained humble and totally grounded. He loved life and loved DXing. Peter will be greatly missed by all who knew him.